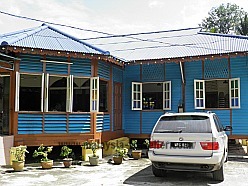 Welcome to my Raub Heritage Trail. 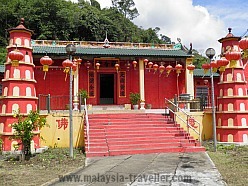 Raub is a small historic town in Pahang, on the main road linking Bentong to Kuala Lipis. 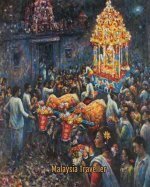 It is most famous for its gold mining heritage. Gold was first mined here in the 1800s. 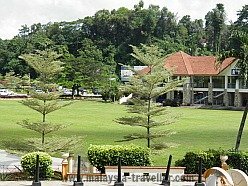 It is said that the town was named Raub (which means 'scoop') because miners would find specks of gold in every scoopful of sand dug out of the earth. The Raub Australian Gold Mine (RAGM) company, with origins in Queensland, was responsible for most of the mining which was carried in the district up until 1962. 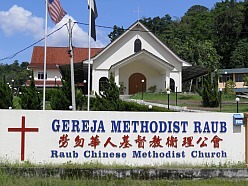 Some of the streets in Raub such as Bibby Road (now renamed Jalan Tun Razak) and Mason Road (now Jalan Tengku Abdulla) were named after RAGM managers. The recent surge in gold prices has enticed companies to restart operations in the area. The old heart of the town consists of just two parallel streets of traditional shophouses surrounded by a few colonial-era buildings. 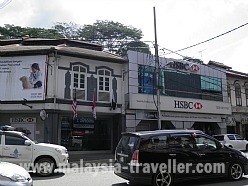 Like most other Malaysian towns, in recent years new developments and suburbs have greatly expanded the town but the historic centre is still fairly well preserved. Lata Jarum waterfall and Rafflesia flowers. Jeram Besu white water rafting. Surrounding forests, hills, farms and orchards. The scenic road to Bukit Fraser via the pretty village of Tras. Plans were also announced recently to build a living gold mining museum complete with working exhibits, underground tunnels and shafts. Tourists will also get the opportunity to pan for gold with guaranteed success of finding a speck or two in every pan. I have seen a similar attraction in New Zealand and it should be popular in this part of the world. For now you can make do with viewing the heritage buildings shown on this map. 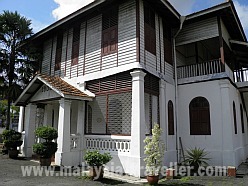 Photos: (L) This well preserved colonial-era bungalow is still in use. (R) The former Police Station is dated 1906, making it one of the oldest in the country. It is now vacant and looking for a new use. A Tourism Information Centre perhaps? 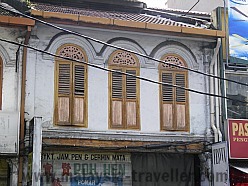 Photos: (L) The two streets of shophouses are interesting and the kaki-lima is clutter-free and intact. 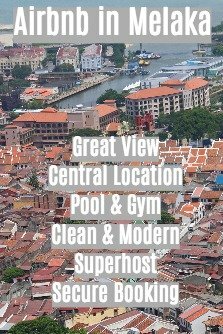 (R) Banks (all banks, not just HSBC) are some of the worst offenders when it comes to over-modernising shophouse exteriors or worse still, demolishing them altogether and spoiling the overall appearance of the street. 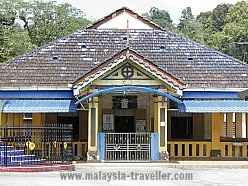 Photos: On Jalan Lipis there is a row of religious buildings of different faiths - Raub's equivalent of Melaka's Harmony Street. 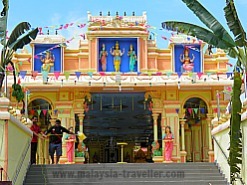 Next door to each other are the Sri Subramaniar Alayam Hindu Temple, a Chinese Temple, a Chinese Methodist Church and the Gurdwara Sahib Sikh Temple. 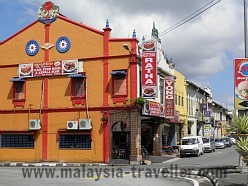 Ratha Restaurant is one of the better known establishments in town, famed for its fish head curry and chicken curry. 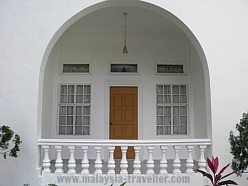 The Sentosa Seafood Restaurant is housed in a bright blue colonial style bungalow located close to what used to be the padang. 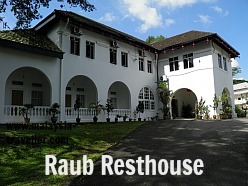 For heritage lovers, the only place to stay has to be the Resthouse located in the centre of town on a low hill overlooking the green field of the former padang. The Resthouse is far from luxurious and the original look of the lobby has been lost due to over-renovation but there are a few old photos on the walls and the building still has character. 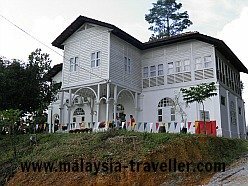 Alternatively you could continue your journey on to Kuala Lipis which is another interesting heritage town with a wider range of accommodation.